The law of attraction is based on this simple principle: You attract what you are. In other words, you create a reality that is a reflection of you. The concept is described differently in all manner of spiritual teachings, but it comes down to the same thing: We create our realities from the inside out. Many people describe the law of attraction as the process by which thoughts become things. My own interpretation is a bit different. I believe the process has more to do with energy dynamics. It’s about becoming conscious of your internal state, attuning to your own energy to that, and using the connection to create your reality. While this may seem abstract, I’ve found that with the right guidance, the process is really simple and practical. 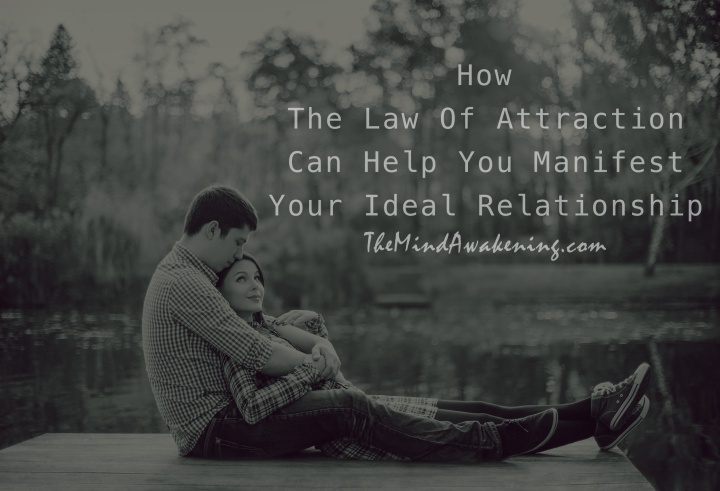 Below are the three steps you need to use the law of attraction to manifest an amazing relationship. Attune your energy to that inner frequency, and your external reality will transform. 1. Connect with your true nature. We all have it. Some people call it love, some call it truth, some call it the higher self and some call it presence. Whatever you call it, it is the core essence of everything that exists. When we to tap into this essence, an internal grounding occurs. A feeling of deep connection — of coming home. Attuning to your true nature is crucial to successful manifestation, because only from this state can we create what we truly desire. Anytime we’re longing, grasping, needing, or chasing something on the outside (for example, a partnership), the resultant manifestation will be marked by those same qualities. In other words, you’ll create relationships where you feel longing, grasping, needy, or chasing. This, clearly, is not what you actually want. When you are aligned with your true nature, you aren’t grasping. You, in that state, are complete. Therefore, anything you manifest from this state of being will be infused with that essence of completion and wholeness. The most important step to manifesting love is attuning to your true nature. And the process won’t surprise you. You’ve heard it all before. Step out of the busyness of life, and step into yourself through meditation, self-inquiry, the reading of spiritual texts, or guidance from a teacher. By internally connecting to the energy of connection and wholeness, you will inevitably invite relationships that feel connected and whole, too. 2. Recognize your barriers to love. A major struggle in utilizing the law of attraction is a lack of awareness of limiting beliefs. Limiting beliefs are messages that convince you you can’t have what you want. These are feelings, doubts, fears, or anything else that gets in the way of a clear connection to the feeling of love, wholeness and peace within. For example, if you believe that you’re always going to attract unavailable partners, that belief carries a particular energetic frequency (“I only attract unavailable people”). Because you carry this belief, it keeps showing up in your reality. You’re limited by it. In order to change your reality in relationships, you have to destroy these beliefs. Start by noticing when a block, doubt or fear about attracting love arises. Just turn your awareness toward it. Right there — with that simple question — you’ve sown a seed of dissent in the doubt! Continue to make yourself intentionally aware of the new possibility, and it’s likelihood will grow. As it grows, you will outgrow you limiting beliefs about love, and your reality in relationships will transform. When we try to force things into existence (or when we try to control the outcome of a relationship), we’re manifesting from a place of fear, doubt, worry, and disbelief. And you can’t attract an amazing relationship from any of those emotions. It just doesn’t work. Instead, do the inner work of connecting to your true nature and clearing away your fears, and then let the mystery unfold. The more you settle into the beliefs that you are whole and you are love, the less you’ll grasp at control and try to manufacture a certain outcome. The less you do that the faster real love will find you. The process of manifesting gets easier with time and practice. The more your attune to your true nature, the more you’ll trust in the greater force that orchestrates all the details of life. You just have to be you and the rest will fall into place. Attune to the love that is the essence of who you are and it has no choice but to come to you. Please share how you’ll going to use the law of attraction to manifest incredible love.